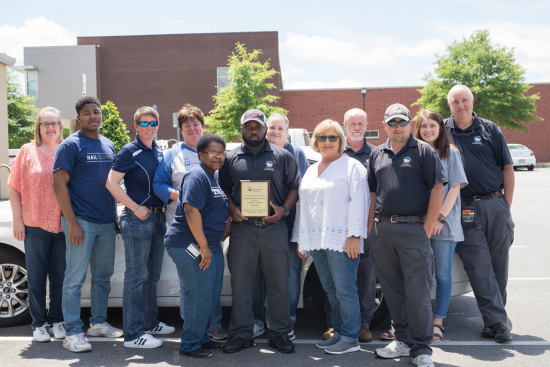 Georgia Southern University’s department of Parking & Transportation was recently recognized as the Organization of the Year by the Parking Association of Georgia. The department was recognized in Augusta at the Parking Association of Georgia’s annual conference for its efforts in enhancing campus community life by offering virtual services, such as the new License Plate Recognition System (LPR) and online permit management. North Carolina State University, Washington State University Pullman and the City of Boise have adopted similar virtual systems following Georgia Southern’s lead. The division of Auxiliary Services is comprised of six departments including University Housing, Parking and Transportation, Eagle Dining Services, Eagle Card Services, Health Services and Retail. These departments all work together to provide the Georgia Southern University community with quality products and services. Auxiliary Services supports the strategic direction of the University and is committed to its advancement and success. Visit GeorgiaSouthern.edu/auxiliary.